Public sector banks may have to re-engineer their approach to manage quality of assets to stay competitive, more particularly when new players are entering the banking domain. With State Bank of India (SBI) and most large banks announcing their performance results of first half (H1) of FY16, among the significant indicators, it is obvious that (i) asset quality status continues to cause concern (ii) credit growth is yet to pick up (iii) profitability is diminishing despite increase in business levels. Though the stressed assets in the banks are at 10.9 per cent in September 2015, a tad less than 11.1 per cent recorded in March 2015, the surge in fresh non-performing assets (NPAs) are causing an added worry. Thirty four listed public sector banks (PSBs) saw gross NPAs rise to Rs 2.85 trillion, up 22.85 per cent from Rs 2.32 trillion in June 2015. Since the bad loans are on rise, profits of most PSBs have seen a low due to higher provisioning and lower interest earnings. The Provision Coverage Ratio (PCR) – the total amount set aside as provision against NPAs of banks has been fast depleting and restructured loan portfolio continues to pose challenge to the asset quality. But one of the good features in performance is the drop in the NPAs of SBI from 4.29 per cent in June 2015 quarter to 4.15 per cent in September. Even in some of the private sector banks, NPAs have begun to show a mild rise. The overall position of asset quality does not augur well for the banking sector. According to the banks, the state of asset quality may continue to cause concern for another two quarters before they stabilise. Key NPAs of top five PSBs will be able to reflect the concerns of the industry. The data in the table below indicates that with the exception of SBI, the rest of PSBs have recorded a substantial rise in their NPA levels. The addition of fresh NPAs in some large banks add to the woes. The stock of restructured assets in the portfolio is getting added to the stock of NPAs. Any rise in NPAs hurts the bank in two ways (i) such loans cease to earn interest for the banks (ii) calls for additional provisioning from out of profits. 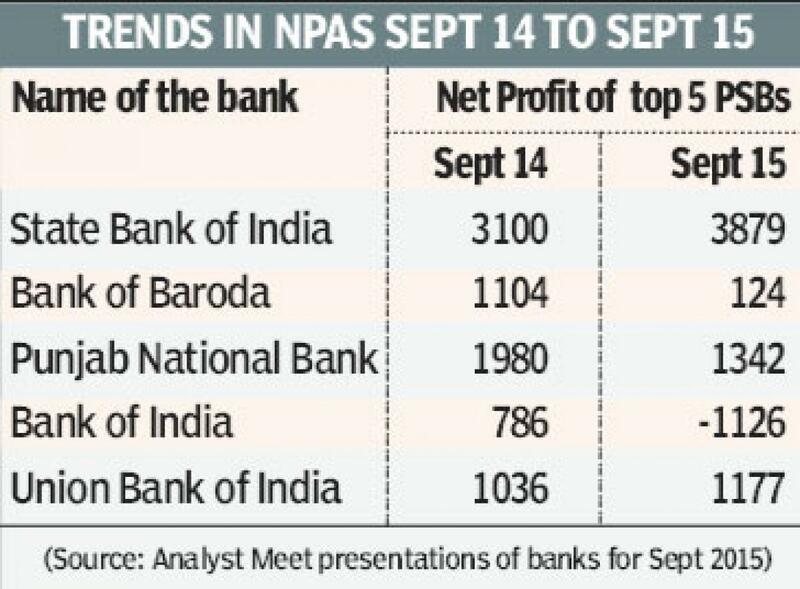 As result, rise in the level of NPAs tends to impact profitability of banks. Its linkage can be seen shown in the table on the left. The rise in profits is seen in SBI and Union Bank of India (UBI). Though NPAs have gone up in UBI, the net profits have gone up indicating that their other parameters of performance could neutralise the impact. Since the profits of bank stems from the quality of business, banks will have to galvanize profitable business through growth. The deposit growth of the banking system is at 6.3 per cent and credit growth works out to mere 3.8 per cent up to October 16, 2015 during the current fiscal. The demand for credit is yet to pick up and deposit growth has not been very significant. Keeping a growth target of 12.5 per cent set by RBI for FY16, lot of thrust is needed to accelerate credit growth. The recent dip in base rates is yet to make an impact on the off-take of credit. Many banks have been announcing concessional home loans at base rate with waiver of processing charges and stretched repayment period to make the home loans more affordable. 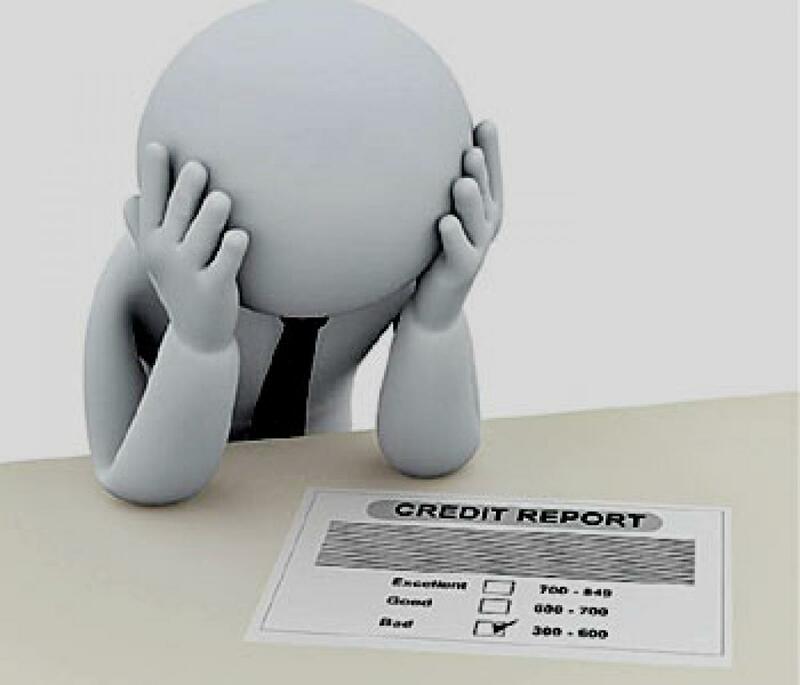 PSBs saddled with large pile of NPAs have to meet the immediate challenges of (i) managing asset quality and speeding up qualitative credit delivery (ii) step up preventive focus on quality of credit to reduce fresh NPAs (iii) sharpen strategies to shore up profitability through fee income generation. The long term challenge will include innovative sustainable strategies to (i) stay competitive in the enlarged banking space (ii) push electronic banking to reduce transaction costs that can help in improving profitability (iii) Create a better customer centric culture to improve market share. PSBs may have to reengineer their approach to manage quality of assets to stay competitive, more particularly when the new entrants are fast bracing up.